To experience a great breakfast is to feel energized after a great meal. Is breakfast an essential in everyones daily routine? What is your favourite part? The eggs? The bacon? Toast? Is it your local neighbourhood greasy spoon? Or your go to with Grandma? Moons Over my Hammy. Laughing, orders being taken by involved employee’s, newspapers flipping, and of course the MMMMM that comes out of my dad at the end of the table where he sinks his teeth into fluffy, yet cooked to perfection pancakes. All sound waves are traveling amongst each other like the employees delivering meals. 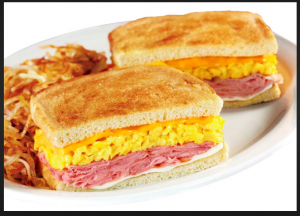 Warmth, with eggs that are fluffy, ham that is smokey, swiss cheese and cheddar cheese that’s melted to perfection all in my mouth at once. Denny is not just the name of your favourite relative but your favourite breakfast spot too.